Think your PC is slow? 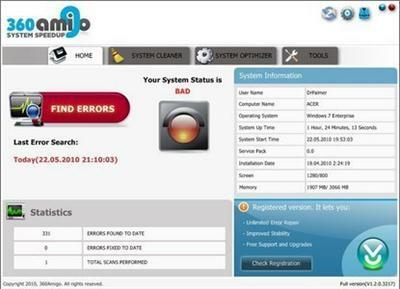 360Amigo System Speedup can quickly identify and fix a wide range of errors and speeds up your slow PC. 360Amigo System Speedup detects and removes all unused files in your PC from faulty software installs/ uninstalls, it optimize your Windows for faster start-up times and stops malicious processes from running on your PC. It also cleans traces of your online activities such as your Internet history, cookies, temporary files, logs, invalid links and much more. But the best part is that it's small, fast and furious (normally taking less than a minute to run). 360Amigo System Speedup will get the most out of your PC and make it like new again. Both beginners and experienced users will enjoy the available features and options.